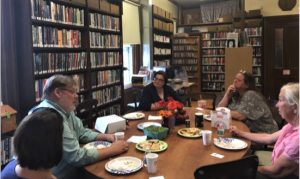 MLS staff and members recently gathered together for a small library potluck at the Cushman Library in Bernardston to discuss issues important to small libraries. Among the topics of discussion were MassCat, Delivery, Summer Library Program, and using outdoor space to expand the library walls. Thank you all for the great conversations and to the Cushman Library for hosting. Keep an eye on our calendar for more forums in the new year! This entry was posted in News and tagged Small Library Potluck by mandy. Bookmark the permalink.